Minister President Günther H. Oettinger honoured the accomplishments of this year’s award winners. “Each of the award winners ensure in his or her own area that a form of culture, communication and hospitality is developed from the general basic need for food.” For Baden-Württemberg, the land of connoisseurs, high quality in the wine cellar and kitchen play a key role in creating a place that is liveable and loveable. “We are pleased that the prestigious culinary prize is awarded here, underlining Baden-Württemberg’s top position in high-level gastronomy in Germany and Europa,” Minister President Günther H. Oettinger said. 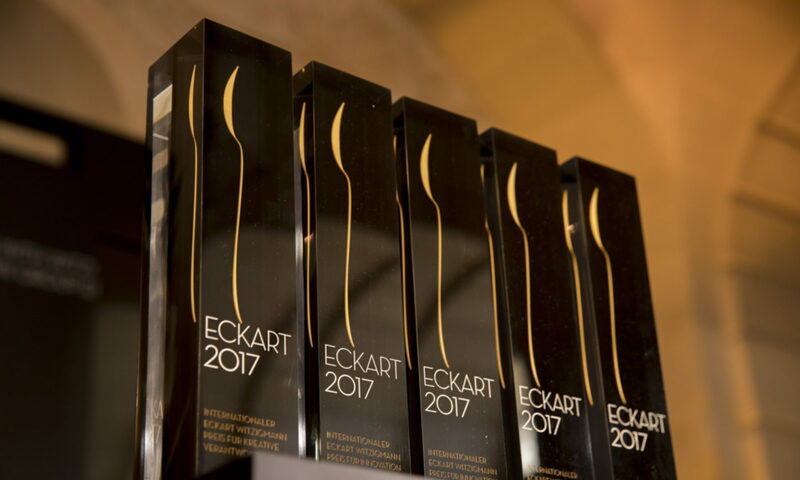 The International Eckart Witzigmann Award is awarded in partnership with the state of Baden-Württemberg and Tourism Marketing GmbH Baden-Württemberg; they convey the topic of the land of connoisseurs in a particularly committed and successful manner. The award winners in 2009 continue the series of outstanding award winners of the past five years, such as Ferran Adrià, Marc Haeberlin, Thomas Keller, Frédy Girardet, Harald Wohlfahrt and Hiroyuki Hiramatsu, as well as Carlo Petrini, Günter Grass, Dieter Kosslick and Daniel Spoerri. After her father’s death, Anne-Sophie Pic took over the restaurant in Valence. Traditionally it has been among France’s top addresses. Anne-Sophie Pic managed to receive the third Guide Michelin star as the third generation in a row, as the first woman and a lateral entrant. Friend of children and storyteller, writer and songbook illustrator, caricaturist and graphic artist, social critic, cynic and toy collector, farmer and cattleman, gardener and cook, Alsatian and convinced European, roamer between worlds, a unique multi-talent, is one of the most brilliant draughtsmen in the world. And with his more than 40,000 drawings he’s also one of the most productive artists of our day. Like no other, Tomi Ungerer has recognised, appreciated, described and drawn the power of the art of cookery, and in this way he has conveyed a very important message particularly to children. Alice Waters has already been cooking since the early 1970’s at her Californian gourmet restaurant “Chez Panisse”, one of the best in the USA, using French recipes in a fresh, seasonal, and biological style and with products that she buys from farmers in close proximity. With her initiative “Edible Schoolyards” to set up vegetable gardens at schools, she has given sustainable impulses to mass catering. The star chef also brought her “delicious revolution” to Washington, where she is now cultivating a vegetable garden at the White House on behalf of the president. Alice Water’s second passion is the world of film. At the beginning of the year she exchanged her place among pots and pans and in the garden with a seat on the jury of the 59th International Film Festival Berlin. Born in Baden and spending his childhood in the Black Forest, has made it clear in his working life in a masterly way that his cooking is not artistic craft, but rather art in the wonderful world of the culinary arts. Dieter Müller became one of the best chefs in the world and he represents German haute cuisine all over the world. With his gourmet restaurant in the Schlosshotel Lerbach in Bergisch Gladbach, Dieter Müller stood for more than 16 years at the pinnacle of German cuisine, highly respected by his colleagues.